Car2x and V2X - these are the current keywords when it comes to the future of safety, efficiency and comfort in road traffic. And whether we talk about Car2x or V2x, we mean the same thing: integrating vehicles into a comprehensive data infrastructure that enables direct communication between vehicles (V2V: Vehicle to Vehicle) on the one hand and infrastructure (V2I: Vehicle to Infrastructure) on the other. Information such as speed, position or status/condition, which is based on the driver's ability to assess when driving conventionally, can now be exchanged and processed directly. the parallel use of different technologies with data fusion (wireless, radar systems of different ranges, laser scanners, image processing systems, etc.). applications such as platooning, an electronically coupled convoy. the Basic Safety Message (BSM) in the USA. In order to ensure secure communication, signed packages (Secured Packets) must also be used. The CAR 2 CAR Communication Consortium (C2C-CC) is a non-profit association of European vehicle manufacturers, suppliers, research institutions and other partners. The C2C-CC aims to increase road safety and efficiency through the use of cooperative Intelligent Transport Systems (ITS) through vehicle-to-vehicle (V2V) and vehicle-to-infrastructure (V2I) communication. 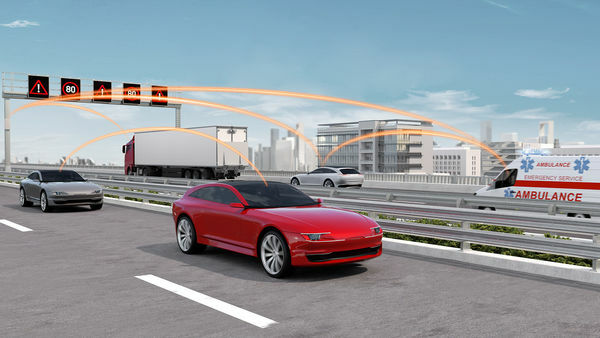 Through its active membership as Associated Member, Vector Informatik underlines its commitment to providing a suitable tool portfolio for the development and testing of driver assistance applications. Vector Informatik is a Associated Member of the CAR 2 CAR Communication Consortium and participates regularly in the workshops. Thanks to Vector's expertise and many years' experience in the Car2x environment, you profit from high-performance products and services with which you can solve your challenging problems more efficiently, faster, and more cost-effectively.